How do I allow members to update account information? ﻿From the Member Actions section of the General Settings page, you may enable your members to take specified actions when they log into their accounts. Members are able to take these actions the member access hours are set to open. Read on below to learn more about each setting. ﻿By selecting this setting, members will be able to schedule a temporary hold on the account. During the time that a members account is on a temporary hold, they will not appear in your delivery reports. When members schedule a hold, they will receive an automatic response email. Click "View automatic response email" next to this setting in order to edit the contents of this message. Temporary holds are listed under the Details header of a member account in the dashboard. From here, you may adjust and remove holds. If you offer any seasonal payment plans and check this box: Members will be able to add shares and options to their current subscription and set up additional payment at that time. Members will not be able to remove any shares or options from their subscription. If you ONLY offer ongoing payment plans and check this box: Members will be able to add and remove shares and options from their current subscription. They will not be asked to make an additional payment for these changes; they will continue to be charged according to their payment plan. They will not be able to remove all items from their subscription and must maintain at least one subscription. Click here to learn about why a member may not be able to edit a subscription. A. By selecting this setting, members may change their current pickup site to a different pick up site or home delivery. The change is considered a permanent change, until the member or admin changes it again. To change their pick up site, members will click the button marked "Permanent"
Members set up with home delivery will not be able to change their location, an admin can update their location from the dashboard. B. 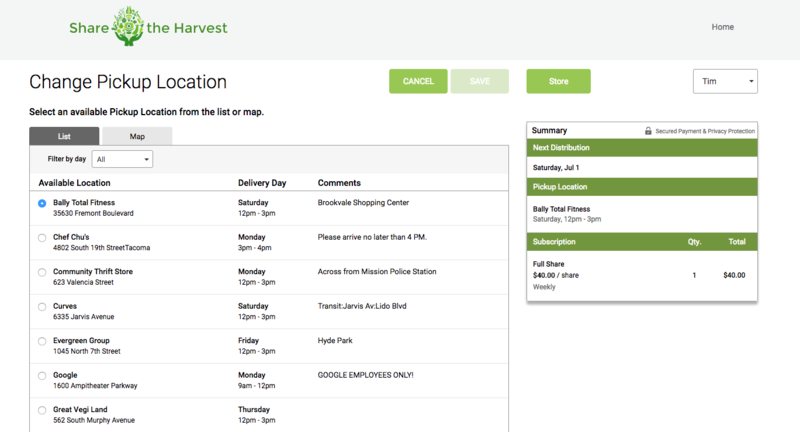 There is an optional setting that will allow a member to change their pick up site for only the upcoming delivery, and the system will automatically change them back to their original pick-up site when the delivery is complete. ​To change their pick up site for only the upcoming delivery, members click the button marked "Next Delivery"
When members make a one time pick up site change, they will receive the automatic response email, "Pickup Site for One Delivery Updated". 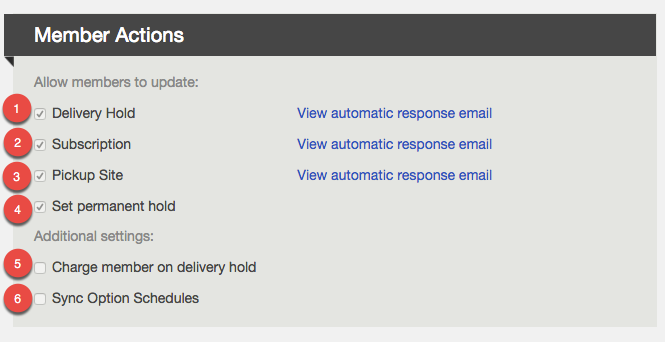 View and edit this email under Settings --> Emails --> Automatic Responses once the feature is enabled for your system. Contact Support to learn more about the one time pick up change and have it enabled for your program. If this setting is enabled, the member can check the box and save to place their account on permanent hold. The member can remove the hold any time from their account by unchecking the box and saving. If you operate Seasonally: When a member's account is put on a temporary hold, the value of the missed delivery will automatically appear as a positive credit to their balance by default. If you check the box for this setting, this will not occur. If you operate on an Ongoing basis (i.e. year-round): When a member's account is on temporary hold and they miss a delivery, the value of that delivery is not deducted from their balance on account and the member is not charged for the missed delivery. But if you check the box for this setting, your members will be charged for the missed deliveries. 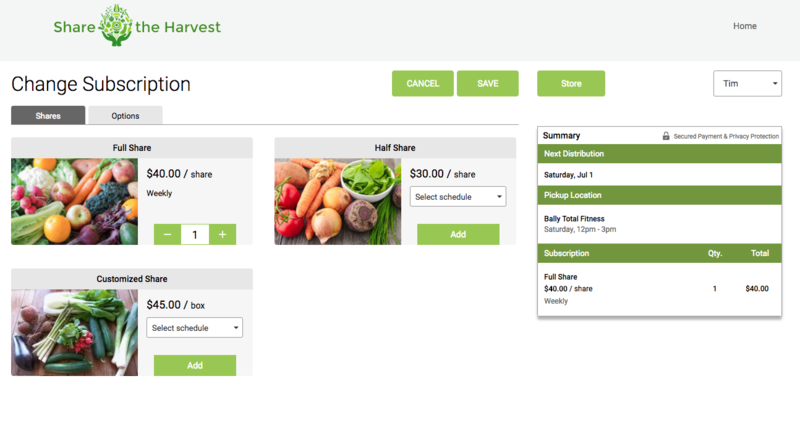 When this setting is enabled members can only add options to their subscription that correspond with the schedule of their selected share. Learn more here.